Please note that the content of this book primarily consists of articles available from Wikipedia or other free sources online. Ivo Ferriani (alternate listings: Ivo Ferriani, Ivo Ferriani. born March 5, 1960) is an Italian bobsledder and sports official. 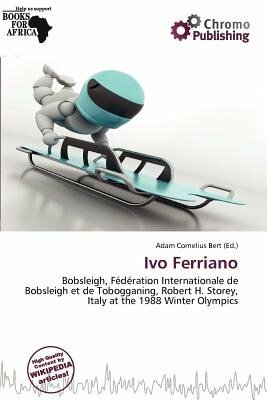 In September 2010, he was elected President of the F d ration Internationale de Bobsleigh et de Tobogganing (FIBT), ending the 16 year presidency of Canada's Robert H. Storey. Bobsleigh or bobsled is a winter sport in which teams of two or four make timed runs down narrow, twisting, banked, iced tracks in a gravity-powered sled that are combined to calculate the final score.